Get Sketchy #35 – Fan-tastic! I’ve been playing with making my own flower embellishments lately, particularly with fan folding paper. The half-circle shape for this week’s challenge made me think of a Chinese or Japanese fan, so I decided to make that the theme of this card. I folded a 2″ x 12″ strip of paper and made it into a fan for the left side of the card. I punched a 1″ circle to glue to the back of the fan to keep it in place. I glued a large glitter brad to the center of the fan accent. 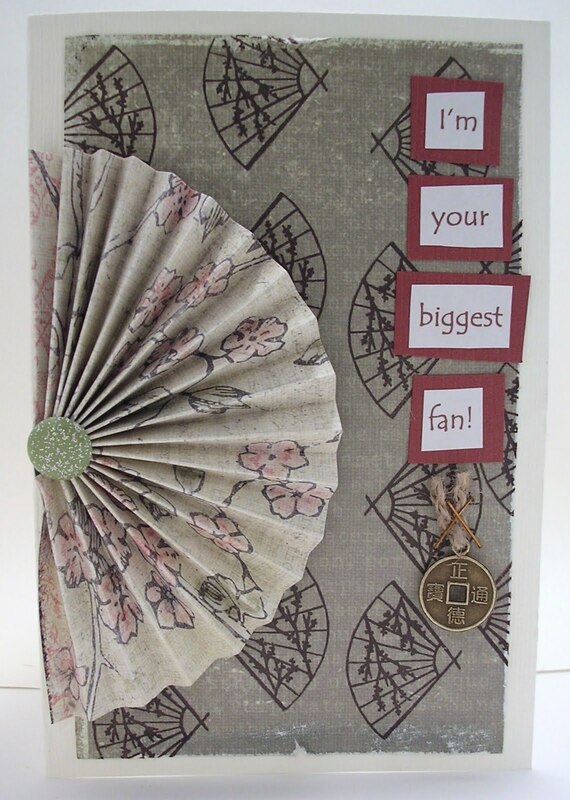 To continue the Asian theme, I used the other side of the paper for my card background, and stamped fans as a pattern on the paper. Then, I typed and printed the sentiment, and mounted it onto cardstock. I threaded a Chinese coin charm with twine and stapled it to the front of the card. The inside of the card reads “Congratulations” in the same typeface and mounting as what’s on the front. I didn’t notice until after I made the card that one of the design team ladies had also used a fan-type accent on her card…but I think our ideas and color choices are different enough!